NASA astronauts Terry Virts and Barry Wilmore work outside the International Space Station to prepare the orbiting lab for future private space taxis on Feb. 25, 2015. An up-close snapshot of astronaut Terry Virts as he works on the Canadarm2 robotic arm outside the International Space Station on Feb. 25, 2015. Virts reported that about 15 milliliters of water was removed from the helmet via a syringe. The water also appeared to come from inside the suit itself, and not from Virts' drink bag. "It's not drink bag water," Virts radioed to Mission Control. "If you taste the water it has a chemical taste … It's some type of technical water." NASA takes any water intrusion into the spacesuit helmets seriously because it poses a danger to astronauts working in weightlessness. In 2013, NASA cut short a spacewalk when Italian astronaut Luca Parmitano reported a substantial water leak in his spacesuit helmet. In that harrowing experience, water at times covered Parmitano's nose, mouth and ears. Virts and Navias both stressed that only a small amount of water was involved in today's incident. A similar minor leak was reported in the same spacesuit by a different astronaut in a December 2013 spacewalk, Navias added. Still, NASA engineers will study the water incident while reviewing plans for the next spacewalk planned for Virts and Wilmore. Today's spacewalk was the second of three excursions to upgrade the space station's docking ports to receive future commercial space taxis. Astronaut Barry “Butch” Wilmore outside the International Space Station during a spacewalk on Wednesday, Feb. 25. 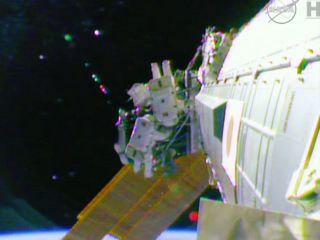 During their work today, Wilmore (the station's commander) and Virts installed power lines on a station docking port as part of that space taxi preparation work. Virts also lubricated the station's Canadian-built Canadarm2 robotic arm, which had been "exhibiting some creakiness" according to NASA. The astronauts also worked on the station's hub-like Tranquility module, with Wilmore completing tasks related to the future installation of the Bigelow Expandable Activity Module (BEAM) — a new inflatable room for the station built by the private company Bigelow Aerospace that will arrive aboard a SpaceX Dragon capsule later this year. The astronauts began their spacewalk about 6:50 a.m. EST (1300 GMT), ahead of schedule. They safely re-entered the station about 1:35 p.m. EST (1835 GMT). At the end of the spacewalk Wilmore extended a "thank you" to Jeff Hanley, a former flight director who now heads up the EVA, or spacewalk office, at the Johnson Space Center. "As we say in the Navy, fair wind and following seas," Wilmore said. Virts and Wilmore completed a series of precision tasks, which proved challenging in the changing light conditions. As the space station orbits the Earth, the astronauts experience about 15 sunrises and sunsets every day. As a result, Wilmore and Virts found themselves occasionally working in full sunlight, and occasionally working in darkness, using artificial lights to guide their way. This is the second of three spacewalks that Virts and Wilmore are scheduled to complete in less than two weeks to help upgrade the station. The first spacewalk took place Saturday (Feb. 21). The final spacewalk is scheduled for Sunday (March 1). The spacewalks are being undertaken to prepare the station for the installation of two international docking adapters, which can receive commercial spacecraft that will carry new crew members from Earth to the station. Last year, NASA granted contracts to Boeing and SpaceX to build commercial crew capsules to bring crew members to the orbiting laboratory. Linking up these future space taxis with the orbiting station will require the installation of the new docking adapters. The IDAs will be launched to the station on two different SpaceX Dragon cargo spacecraft later this year. The commercial space taxis will allow the station's onboard crew to grow from six to seven. Today's excursion was the third career spacewalk for Wilmore, who participated in his first spacewalk in October 2014. This was the second spacewalk for Virts. The two NASA astronauts were assisted from inside the station by European Space Agency astronaut Samantha Cristoforetti, who helped the two spacewalkers get into and out of their spacesuits. Cristoforetti also assisted Virts by operating the robotic arm while he applied the lubrication. Wilmore, Virts and Cristoforetti are joined by three cosmonauts on the station: Alexander Samokutyaev, Elena Serova and Anton Shkaplerov. Wilmore, Samokutyaev and Serova are scheduled to return to Earth in March. Virts, Shkaplerov and Cristoforetti are scheduled to return in May.